Bluapple with Activated Carbon absorbs and neutralizes the ethylene gas given off by produce to keep it fresh 2-3 times longer than normal, as well as ridding your refrigerator of odors. Just place your Bluapples inside your crisper drawer, on a shelf in your fridge, or in a fruit bowl on the counter, and you're good to go. I don't have to waste produce! This BluApple has helped to lower my produce budget by keeping produce fresh. Thank you Grommet!! They work better than I ever expected. I put one in each of my hydrator drawers and they work well! Very pleased with this purchase! No one likes wasting fruits and vegetables, yet the average family of four throws away as much as $600 worth of spoiled produce each year, according to the USDA (it’s not all that hard to imagine when an organic apple can cost $1.50). We’ve discovered an easy way to preserve the edible life of your produce, so you have more time to consume it instead of composting it. With this simple little product called BluApple, you can extend the storage life of produce by as much as threefold. 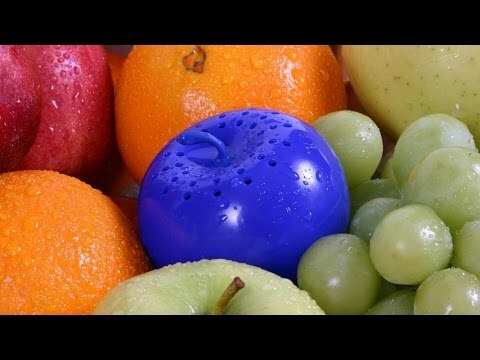 BluApple works by absorbing ethylene gas, which is given off naturally by fruits and vegetables. If ethylene gas builds up in your food storage area, it speeds the ripening process and accelerates decomposition. Entrepreneur Timmy Chou, who founded BluApple, was inspired by the science applied for years to prevent spoilage in industrial environments like ocean liners, trucks and warehouses. He created a consumer product that makes use of the same non-toxic active ingredient (sodium permanganate). Each BluApple can absorb ethylene gas in a typical home refrigerator, produce bin or storage container for about three months (after that, refill packets are available). Simply place a BluApple where you keep your fruits and vegetables, and then sit back and enjoy them. . . for much longer.